On a lovely, sunny Friday we had duffy theater and the characters were Afi, Miss Rude, Lovely, Duffy, Scruffy and Vautra. My favourite part was when Afi and Duffy were guessing the words and then Duffy was asleep. He had a dream then he woke up and Vautra came and said hi and Duffy said hi to Vautra. Duffy said “what are you doing here? you're not allowed”. then Vautra said “I want to challenge you”. Duffy said “ok lets challenge”. They were thinking of a word to rhyme, then Vautra won. After that they changed over, Duffy was the referee then Vautra and Lovley were vs then lovley won. Duffy said “try again” then he said “ok”. The next game was Vautra vs Miss Rude, Miss Rude won. Vautra was sad and he said “I will never give up, I will steal all your words”. 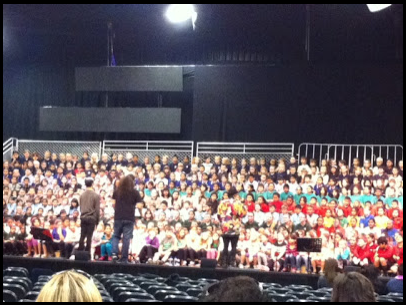 On the evening of Friday 13th, 15 schools came to perform in the kids for kids concert. It was so joyful and exciting. Jackie Clark and Nathan King were singing with us. I said to myself “I am so hot and sweaty” when we were singing. Backstage we were playing some games and we were playing knucklebones and monkey barrel. When we got on stage I felt uncomfortable and I was so tired and nervous because the lights were hot, I was nervous again. At halftime we had some supper, we had chocolate and biscuits. We were playing knucklebones and monkey barrel again then we came out on the stage again. There were two soloists singing Weather With You, one of them was Rosalina from our class. Jackie Clark and Nathan King came out for the songs again. Chris was our conductor and he helped us to do the actions for all the songs. All the people were cheering and supporting us. We were singing Poi e and there were 2 dancers and 5 dancers for that song. All the people were laughing. Jackie said “this is the last song” and everybody said “oh no”. The last song was She’s A Mod. On Friday we went for the kids for kids concert and we were singing with different school and their teachers.We had Chris he was the conductor the and we had to follow the actions he showed us. The audience was really packed and the lights were hot. On a rainy day we had teachers and parents celebrate St Pius X Feast Day. We sang songs and we had fun smiling. People were so happy then we had our hands waving and we celebrate together. Everyone had Holy Communion and everybody was so happy and joyful. Next we had to cut the cake into pieces, it was a banana cake. The cake was to celebrate St Pius X’s Feast day. Today I learnt my basic facts because of Xtra maths and Math whizz. We have been talking about skills and and how to practise our skills in maths and think about what we are doing. The stage I'm at is Stage 3. I like maths because it is very helpful you to learn do it fast. I’m learning about fractions, how to read and write them.